Derek Flitter was an undergraduate and postgraduate student of The Queen's College, Oxford. He was Laming Junior Fellow at The Queen's College and then British Academy Post-Doctoral Fellow in Spanish at Oxford between 1986 and 1990. 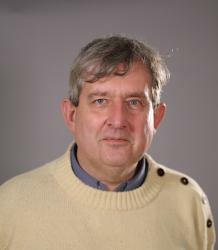 After sixteen years working at the University of Birmingham, he came to Exeter as Professor in Spanish in 2007. The main focus of his research has always lain in Spanish Romanticism and modern Spanish intellectual history, beginning with his 1992 monograph Spanish Romantic Literary Theory and Criticism (CUP) and continuing with his 2006 book for Legenda on the Romantic historical imagination in Spain. He is currently completing a book on eschatological elements in Spanish Romantic drama. Professor Flitter has published extensively also on modern Spanish poetry and on Galician literature. He is the editor of a number of collections of essays in the area of modern Spanish literature, and was Hispanic Editor of Modern Language Review between 2006 and 2014. A period of study leave in 2015 saw him begin work on a new monograph dedicated to the place of Gustavo Adolfo Bécquer in the Spanish literary canon and in the history of Spanish aesthetics.